Many book and movie plots have suggested that the giant Megalodon shark could still be alive in the deep oceans (such as the Marianas Trench). The argument goes that most of the deep ocean lies unexplored, so who knows what could be down there, maybe there is a Megalodon. But, how much scientific reality is there to this argument. One claim is made that we had never caught or filmed other large animals like the Giant Squid until the past few decades. The problem with this is while it’s true we had not seen them alive until recently there has been plenty physical evidence of there existence for centuries. This ranges from carcasses washed up on beaches, to huge sucker marks on Sperm Whales. With the Megalodon, ZERO physical evidence has been found alluding to its unseen presence. If it was still alive there would be no shortage of whales with giant bite marks out of them. The Megalodon thrived in the shallow waters that held plentiful sources of large mammals to eat. Its entire biology required a high metabolic rate and large amounts of food. 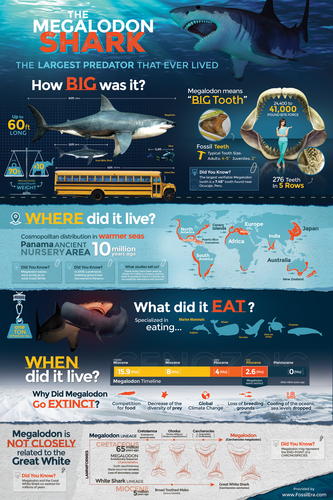 It’s been estimated that an adult Megalodon needed over 1 ton of food per day to survive.These food sources do no exist in the deep ocean. While there are a few large sharks that live in the oceans deep such as the Megamouth, these sharks a heavily adapted towards life there. They are slow moving, and their biology is built around being able to survive for weeks without a meal. Simply put, the Megalodon shark’s body plan would not have allowed it to live in the deep ocean. If by some change (and there is zero evidence for it) that it did evolve into so deep water shark, biology would dictated that it looked and behaved nothing like a Megalodon. So, it wouldn’t be a Megalodon. So, while some bloodthirsty monster ascending from the depths to much on helpless fishermen may make for a good movie plot, there is no scientific basis behind it being possible.